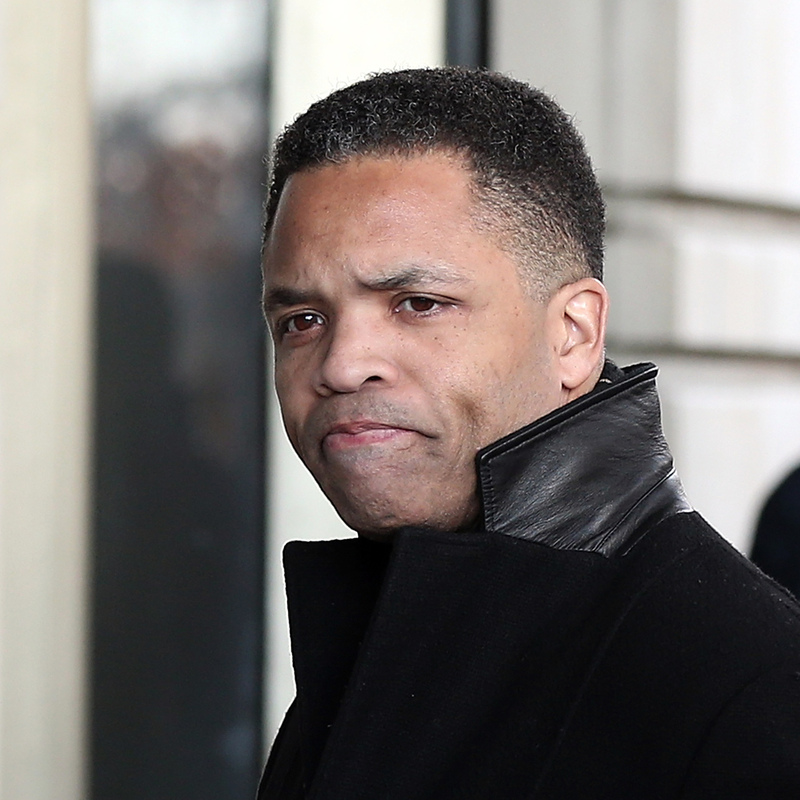 Guilty Plea From Jesse Jackson Jr. Over 'Lavish' Spending : The Two-Way The son of Rev. Jesse Jackson was accused of using $750,000 of campaign funds on personal expenses and to buy things such as a $43,000 watch and a hat once worn by Michael Jackson. Former Rep. Jesse Jackson Jr., D-Ill., as he entered court in Washington, D.C., on Wednesday. We most recently updated the top of this post at 2:50 p.m. ET. Saying that "I've never been more clear in my life" about what he was doing, a tearful Jesse Jackson Jr. on Wednesday pleaded guilty to using about $750,000 in campaign funds collected for his congressional races to buy himself presents that included a Rolex watch worth more than $43,000. The former congressman, a Democrat from Chicago, appeared in a Washington, D.C., courtroom. When he's sentenced in June, he could get a prison term of nearly five years. In a separate proceeding, Jackson's wife Sandi pleaded guilty to filing false tax returns, later in the day. -- $60,857.04 at "restaurants, nightclubs and lounges." -- $16,058.91 at "sports clubs and lounges." -- $14,513.42 for dry cleaning. -- $9,587.64 on children's furniture. -- $5,150 on "fur capes and parkas." Jesse Jackson Jr. will be sentenced on June 28 and his wife will be sentenced on July 1. The prosecutor on the case, U.S. Attorney Ronald C. Machen Jr., said the guilty plea was "nothing short of tragic." "Jesse Jackson, Jr. entered public life with unlimited potential, but squandered his bright future by engaging in a self-destructive course of conduct that was staggering in both degree and scope," Machen said in a statement. "For seven years, Mr. Jackson betrayed the very people he inspired by stealing their campaign donations to finance his extravagant lifestyle. His fall from grace will hopefully chasten other leaders who are tempted to sacrifice their ideals and integrity to line their own pockets." As expected, "former U.S. Rep. Jesse Jackson pleaded guilty this morning to a conspiracy count involving misuse of more than $750,000 in campaign cash, a crime that is expected to land him in prison," as the Chicago Tribune reports. Later today, his wife Sandi is expected to plead guilty to having knowingly filed false tax returns. Their sentences aren't likely to be handed down for several weeks. Former Democratic Rep. Jesse Jackson Jr.'s once-bright political career is expected to officially end Wednesday morning in a Washington, D.C., courtroom. As NPR's David Schaper tells our Newscast Desk, the son of Rev. Jesse Jackson is expected to plead guilty to a federal criminal charge that he used campaign funds on lavish personal expenses. The younger Jackson's wife, former Chicago alderwoman Sandi Jackson, is expected to plead guilty later today to having knowingly filed false tax returns. It was just last Friday, as Eyder reported, when Jackson Jr. was charged with misuse of campaign funds and word broke that he was expected to plead guilty. The Chicago congressman had resigned his seat last November — shortly after winning reelection — as allegations grew that he had used campaign money to purchase, among other things, a $43,000 watch, a $4,600 fedora once worn by Michael Jackson and $5,000 worth of furs. All told, it's estimated that about $750,000 of campaign funds were misspent on personal goods and services. Today's court hearing could reveal more details about Jackson Jr.'s "alleged crime spree," says the Chicago Tribune. It adds that "attorneys familiar with public corruption investigations said the amount of campaign cash allegedly converted to personal use in this case is the largest of any that they can remember." "Sentencing is not expected for several weeks," writes the Tribune. "Jackson Jr. faces up to five years in prison, while [his wife] faces up to three years, according to the U.S. Attorney's Office for the District of Columbia." They have two children, according to the newspaper: "a 12-year-old daughter and a 9-year-old son." Jackson Jr., 47, spent most of 2012 away from his office on a medical leave. It was later revealed that he was being treated for bipolar depression. We'll watch for news from today's court hearing and update this post later.